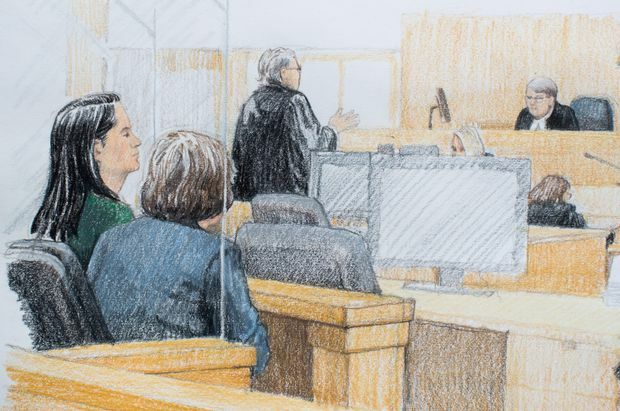 Dec. 7, 2018: In this courtroom sketch, Meng Wanzhou, far left, the chief financial officer of Huawei Technologies, sits beside a translator during a bail hearing at B.C. Supreme Court in Vancouver. Huawei would turn down any order to use its equipment for spying, even if the order came from Chinese President Xi Jinping, a top executive at the Chinese telecom company said Tuesday. Eric Xu, one of the company’s rotating chairmen, made the remarks to Canadian journalists in Shenzhen as the company, facing U.S. charges of fraud and violating sanctions, continues to try to rehabilitate its global image. It’s been more than three weeks since Canada allowed extradition hearings to proceed against Meng Wanzhou, Huawei’s chief financial officer, who was arrested in B.C. in December. She denies U.S. prosecutors’ allegations that she was involved in fraud and is suing the government, the Canada Border Services Agency and the RCMP alleging “serious breaches” of her constitutional rights. Huawei Technologies Co. Ltd. is a Chinese telecommunications company founded in 1987 by Ren Zhengfei. Based in Shenzhen, it has 180,000 employees and creates such products as smartphones, tablet computers, mobile and fixed broadband networks. Its products account for a sizeable chunk of the global smartphone market. While its market share in Canada – where it has operated since 2008 – is still small, its presence here has grown dramatically over the years. Here’s a deeper look by The Globe and Mail’s Susan Krashinsky Robertson and Joe Castaldo at how Huawei built its brand in this country. A Globe and Mail investigation published last May revealed Huawei has established a vast network of relationships with Canadian universities to create a steady pipeline of intellectual property to aid in the development of next-generation 5G mobile networks. Around the same time, members of the Five Eyes intelligence-sharing alliance were warning Prime Minister Justin Trudeau about the national security risks posed by Huawei’s technology. Following The Globe’s report, Mr. Trudeau was urged to gather security agencies and top policy makers to determine the security threat and economic cost of transferring Canadian intellectual property to Huawei. Since then, other critics have added their voices to those expressing concern, including U.S. lawmakers and senators. In September, the government launched a national-security analysis to minimize cyber threats to the country from equipment made by foreign telecommunications companies, including Huawei. 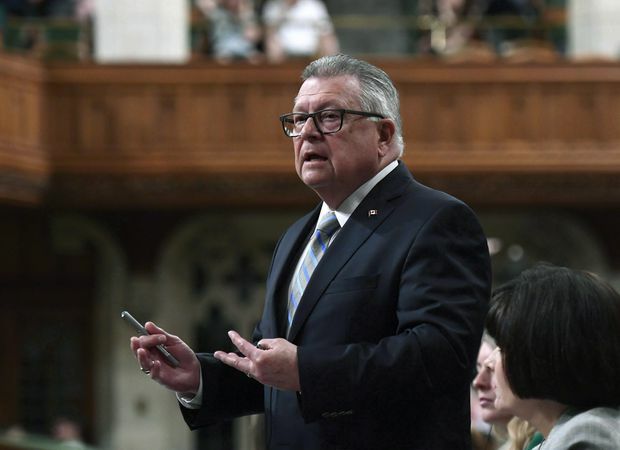 But the federal government eventually backed away from previous assurances that Canadian security agencies were capable of containing any cyberespionage threat and said it is not ruling out barring Huawei from supplying equipment for Canada’s 5G mobile networks. Canadian telcos BCE and Telus are hoping that Huawei’s entry into the 5G market will go ahead so they can use their technology on their own networks. What are the concerns with Huawei’s 5G technology? Minister of Public Safety and Emergency Preparedness Ralph Goodale. Huawei has been working on advanced security technology together with the Public Security Bureau in China’s far western Xinjiang region, which is becoming a pilot zone for advanced new surveillance and population-control techniques. Chinese authorities have spent heavily to build Xinjiang into a test bed for the use of facial recognition, digital monitoring and artificial intelligence in policing. Chinese law requires companies in China to “support, co-operate with and collaborate in national intelligence work” as requested by Beijing. Researchers worry about how technologies developed for authoritarian purposes in China could be brought into other countries under different guises. The United States and Australia have barred Huawei 5G telecommunications, and New Zealand blocked the first request from one of its wireless carriers to install the Chinese company’s equipment on its 5G network, citing a “significant network security risk.” U.S. spymasters say Huawei’s smartphones and networking equipment could be used to conduct undetected espionage, especially the next, advanced generation of 5G technology. Meng Wanzhou, 46, is the chief financial officer of the company founded by her father, Mr. Ren. Her rise to success has been as meteoric as Huawei’s; she was a high-school dropout in 1993 when she started there as a secretary, but now she is its chief financial officer. She is also effectively the global face of the company, appearing on panels with titans of industry and travelling around the world to bolster Huawei’s image amid concerns about its technology. On Dec. 1, Ms. Meng was arrested in British Columbia by Canadian authorities acting behalf of U.S. investigators. They accuse her of fraud in a scheme to violate American trade sanctions against Iran, which she denies. She’s also suing the RCMP and Canadian Border Service Agency for what she says were violations of her constitutional rights during her arrest. She is currently free on $10-million bail in British Columbia, kept under 24/7 surveillance and ordered to stay in the Vancouver area. The United States formally requested Ms. Meng’s extradition on Jan. 29. Once Canadian Justice Department’s International Assistance Force receives such a request, it has 30 days to decide if it’s valid under the Canada-U.S. extradition treaty, which the Justice Department did on March 1. Now, a Superior Court judge will hear the case. Ultimately, the decision about extradition lies with David Lametti, Canada’s recently appointed federal Justice Minister. How do Iran sanctions factor in? Since at least 2016, U.S. authorities have been reviewing Huawei’s alleged shipping of U.S.-origin products to Iran and other countries in violation of American export and sanctions laws. Those sanctions are at the heart of the case against Ms. Meng: U.S. prosecutors allege that Huawei was accessing Iran through a Hong Kong company called Skycom, which the prosecutors consider to be a subsidiary of Huawei. The U.S. Justice Department’s full indictment allege that Ms. Meng committed fraud in 2013 by telling financial institutions that they were separate entities, and that Huawei and its subsidiaries committed obstruction of justice and money laundering to hide their activities. Ms. Meng denies this: In B.C. court, her lawyers have argued that while Huawei did own Skycom between 2008 and 2009, it divested from it. The U.S. Justice Department probe, first reported by the Wall Street Journal, follows a series of actions aimed at stopping or reducing access by Huawei and Chinese smartphone maker ZTE Corp. to the U.S. economy amid allegations the companies could be using their technology to spy on Americans. The probe is reportedly being run out of the U.S. attorney’s office in Brooklyn, the Wall Street Journal sources said. However, the prosecutor’s office declined to confirm or deny the existence of the investigation. Former Canadian diplomat Michael Kovrig and entrepreneur Michael Spavor. Only days after Ms. Meng’s arrest, and after Beijing threatened “serious consequences” if Ms. Meng was not released, two Canadians were detained in China in apparent retaliation. 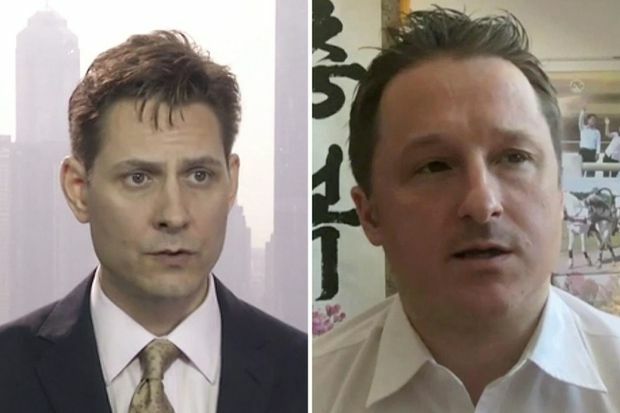 China’s foreign ministry says both men – former Canadian diplomat Michael Kovrig and entrepreneur Michael Spavor – are being held on suspicion of endangering national security. On March 3, days after Canada authorized Ms. Meng’s extradition hearing, China revealed more about its allegations against the two men, saying Mr. Kovrig had worked to steal state secrets, in part with information Mr. Spavor gave him. “Mr. Kovrig’s actions, including stealing and spying on state secrets and foreign intelligence, have seriously violated Chinese law,” said the report on a Chinese Communist Party-controlled website. Canadians have grown accustomed to a warm reception in China, which still lionizes Norman Bethune, the Ontario-born doctor who helped Mao Zedong’s Communists in the 1930s. But the arrest of Ms. Meng has infuriated China and sown fear among Canadians living in the country that, after Mr. Kovrig and Mr. Spavor’s detention, they might be next. Initially, China faulted both Canada and the United States for Ms. Meng’s arrest, but later its foreign ministry and state press focused their attention on Canada specifically. That has called into question Canada’s stated goal of pursuing a trade deal with China. The Sino-American relationship has been rocky recently because of U.S. President Donald Trump’s trade policies targeting Chinese businesses, but after months of escalating retaliatory tariffs, the two countries reached a fragile truce in December. Mr. Trump suggested he might look into Ms. Meng’s case personally if he believed it would help preserve that peace and secure a U.S.-China trade deal. One political casualty of the Meng case is John McCallum, Canada’s ambassador to China, who told Chinese-language media on Jan. 22 that she had compelling arguments to avoid extradition, given Mr. Trump’s remarks on the case. He was widely condemned by ex-diplomats and opposition parties for undermining Canada’s position, and four days after making those remarks, the Prime Minister fired him. For now, Canada is being represented in China by Jim Nickel, a veteran diplomat who had previously been deputy head of mission in Beijing.